Around Christmas I shared this picture of my new lamp that I bought for my bedroom. I'm now using this as a "before shot" of my bedside table. This is the "new look" for my bedside table now. I purchased Penny's (Lavender Hill Studio) mosaic directions online and this is my first project. This was so much fun! If you think you'd like to try to mosaic something, Penny's directions are great and very easy to follow. I had an old matelasse that I cut to make the skirt. It's simply velcroed around the edge of the table for easy removal when it needs washing. I tied a black ribbon around the top edge and added one to the lamp as well because I keep reading that every room needs a touch of black. Large black buttons were also sewn down the front where the fabric overlaps. Click on the photos for a closer view. 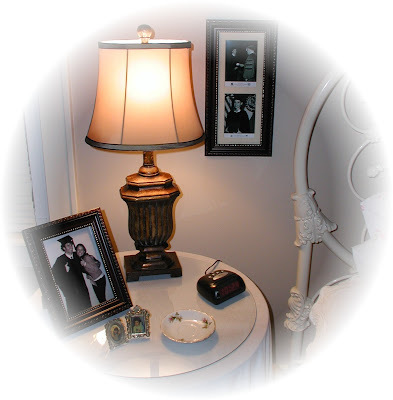 I have a question to ask all my faithful readers, " Should I paint the lamp base antique white or black?" If you think I shouldn't paint it at all, you can also vote. 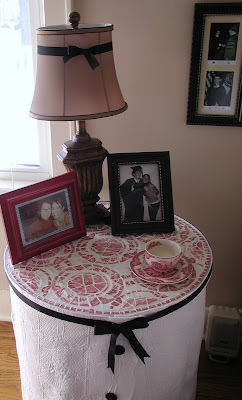 There is a "Toile Party" going on at the Pretty Organized Palace Blog, so go check it out! How chic! That Penny is a marvel and now she's got you looking as if she did it! I love how you dressed the table in the matelasse. I'm not sure that you need to paint that lamp base. You've got the black that anchors everything already. I don't know...I'm no expert. wowee! that's charming! you did a wonderful job with the mosaic :) i also think that the base should stay as it is... i'm all for white things but there is so much white surrounding the lamp already, it will just 'defocal'(dun think there's such a word but i'm sure you understand :)) it... so i say leave it. Catherine, I would leave the lamp base the color it is for contrast. I think you did an excellent job on the mosaic! Good job!! Wow, Cathie! This is gorgeous! I've always wondered if I could do mosaic. Yours is fabulous. If you decide to paint the lamp base, I vote black. It looks great the way it is, though. What a great job and such a fun project!. 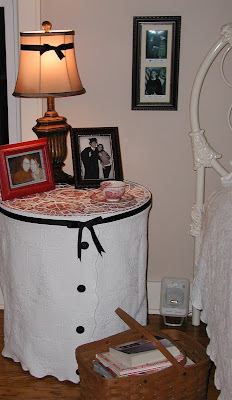 I love the skirt you made for the table. I think the base should be pained black to pick up the back ribbon bow. Isn't Penny just the greatest!. I have one of her teapot lamps and I love it. That table looks gorgeous! I'm going back and forth on the lamp - I like it the way it is - but then I think white would even make the table setting even more cheery! I like the base of the lamp as is. It ties in your basket on the floor and your floor. The black ribbon will be undermined with more black. Imagine me giving advice to Catherine Holman. Your table turned out fantastic Cathie! It reminds me of my little drop leave kitchen table. I think we used the same plates...Johnson Bros Old Britain Castles? It is wonderful! GREAT JOB!! Hi there. Love those decorating colors and that awesome mosaic table! Thanks for your visit and I'm glad that I found your beautiful blog. Your table is amazing. I can't believe that was your first time! Way to go! I love all Penny's creations and this is a wonderful job you've done yourself! Even though I'm a WHITE person, I would leave the lamp as it is or paint it black. My first choice though is leave it! Nice job! Have a wonderful day. The table turned out fabulous!!! I may have to try & make one too. I'll put it on my "to do" project list. So I should get it done around the turn of the century. I vote for painting the lamp base black. Very nice touch. The bow ties and buttons. How cool is that?